Fine Underglaze Blue And White Porcelain Dish With A Hare On A Moonlit Night. With a central circular medallion depicting a hare on the grass on a moonlit night, the rim border encircled by flowering branches of chrysanthemum and flowering sprays with foliage, the underside sparsely decorated with two double circles, a blue and white. Dai nihon séto takashigé sei. Eight-character mark to the base, some kiln-grit adhering to the edge of the thick footring with minor kiln flaws, manufacturing imperfections to the glazed underside (glazed), some kiln smoke to the underside, partly soiled, pinholes. The way the cobalt-blue painting in the central medallion is reminiscent of that of Jingdezhen porcelain (Ko-sometsuke) that was manufactured for the Japanese market. 19.2 cm (7.55 in) maximum cross diameter. Undamaged with no chips, cracks and restoration. Some manufacturing imperfections to the glaze. Old wear to the glaze in general use. Are antiques and works of art with some age, which are unconditionally guaranteed to be genuine as described. The dimensions of each lot stated in the descriptive information are approximate. Due to lighting and shooting conditions, some colour variation and brightness in digital images may vary depending on your computer monitor settings and performance of monitors. Extra images on each lot will be provided upon request. Bank processing times vary from bank to bank and country to country. Offered by postal-administration members of the Universal Postal Union. We cannot be held liable for these charges under any circumstances, as they are beyond our control. All necessary permits in exporting goods from Japan are undertaken for purchasers. 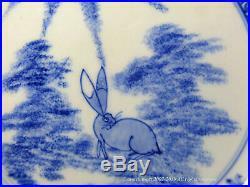 The item "A Fine Blue & White Seto Porcelain Dish With A Hare By Takashige. Meiji 19th" is in sale since Tuesday, April 16, 2019. This item is in the category "Antiques\Asian Antiques\Japan\Plates".